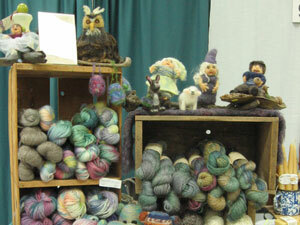 From our flock of Romney sheep, Angora goats and rabbits comes a variety of specialty yarns. Some of the fibre is processed by hand on the farm, some by a local mill. The finished skeins and roving are dyed and hand painted in a wide range of beautiful colours. The dying process takes place on a wood cook stove. Each skein is labeled and includes the name of the animal who contributed the wool.